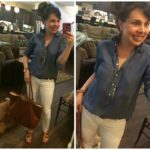 Well, I pulled out one of my most trusted combos again: white denim and chambray. It’s such a great basic look, and you can mix it up in so many different ways with all sorts of different accessories and shoes. 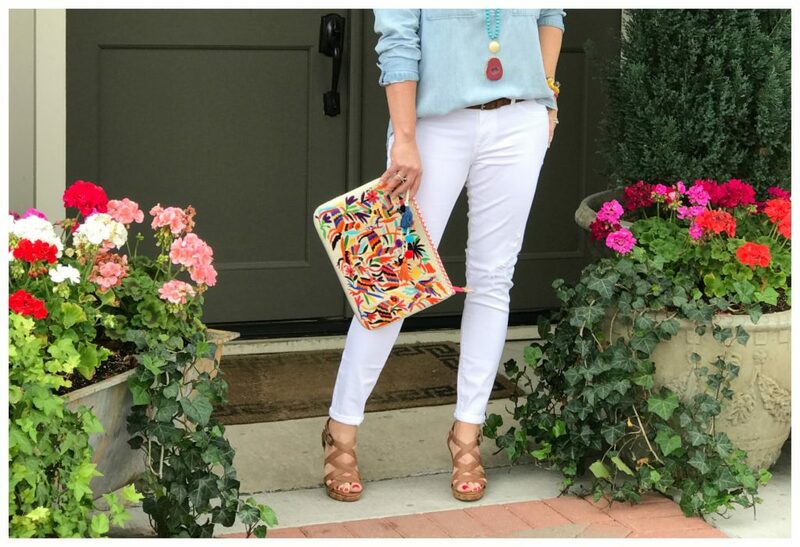 I love wearing this combo with minimal jewelry and my shoreline converse, but today I decided to jazz it up with my wedges, a fun clutch, and lots of colorful jewelry! It definitely dressed up the combo a bit. My short gold necklace says “even more”. Whenever we say “I love you” to Carter, he always responds with “I love you even more.” I love that I’ll always have this sweet little reminder. I sized up to a medium in the shirt, which I often do with button ups. Sadly, the clutch keeps going in and out of stock, but don’t worry….I have some fabulous options for you in a second! I feel like I’m rubbing the DARLINGNESS of the clutch in with this next shot, but I also wanted you to get a good look at my bracelets. WAIT! UPDATE! Thanks to an instagram follower, the clutch has been found HERE for 30% OFF with the code FRIENDS!!!!!!!! Thank you, Ashley! The cushion cut bracelet is now 4 years old, and I still pull it out all the time! It’s chunky, sparkly, and just a lot of fun to wear. The stack bracelets are new, and they come in tons of colors. 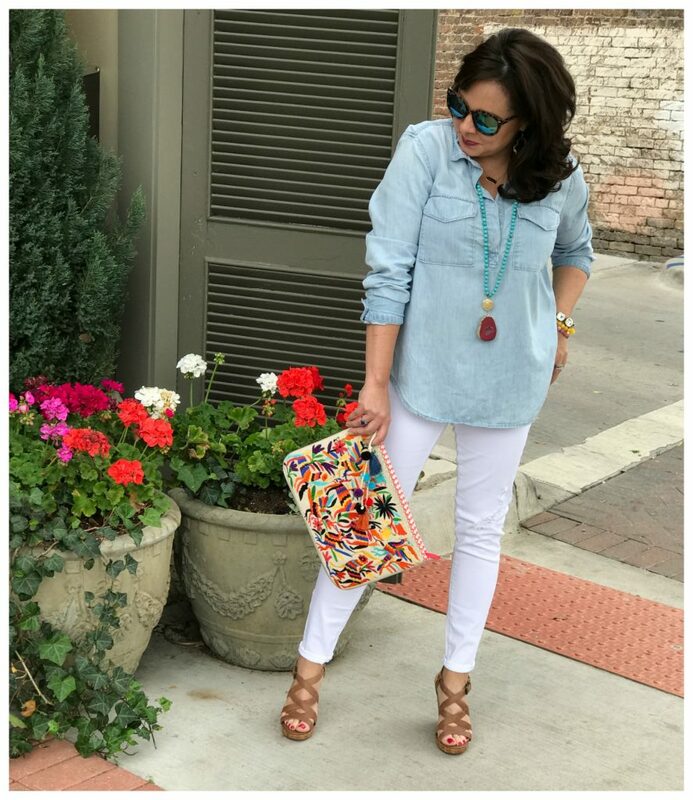 If you like the idea of a chambray shirt with white jeans, but want it to be a little more special, check out these options. 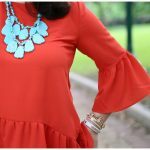 The shirt from LOFT is 50% OFF with FREE SHIPPING today!!!! 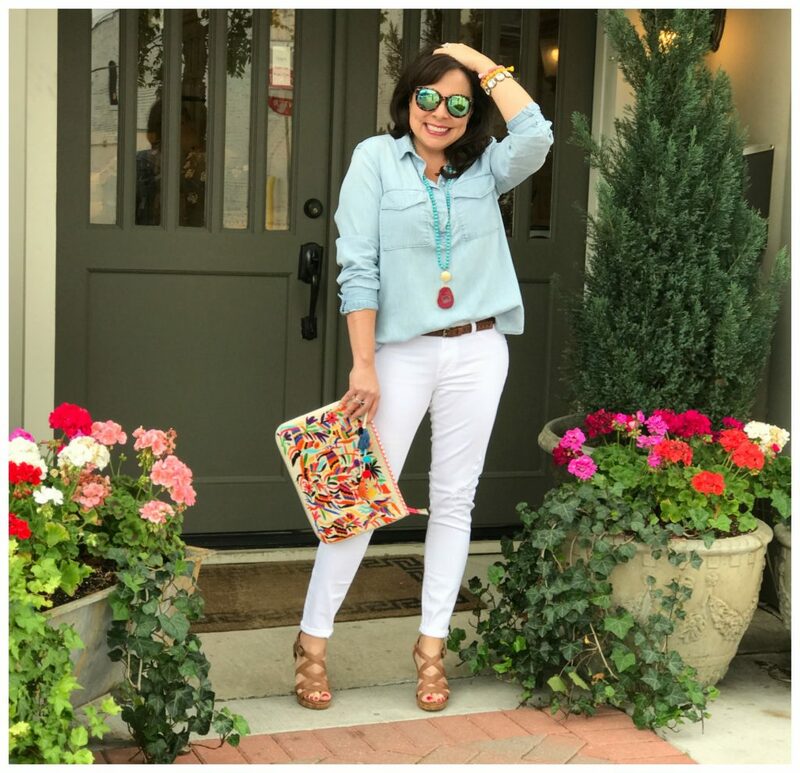 I’ve been wearing THESE white jeans in lots of posts (they’re quite expensive)….but I also really like THIS PAIR (seen below). It’s hard to see, but they have some distressing on them, and they aren’t quite as skinny as my other pair. They are still soft and true to size, I’m wearing a 27. And my sunglasses? Still LOVE them. Still $12. TWELVE DOLLARS. I’m going to give that a second to sink in. 😉 You can click HERE to check out all the BP sunglasses (many that look like designer sunnies) HERE. 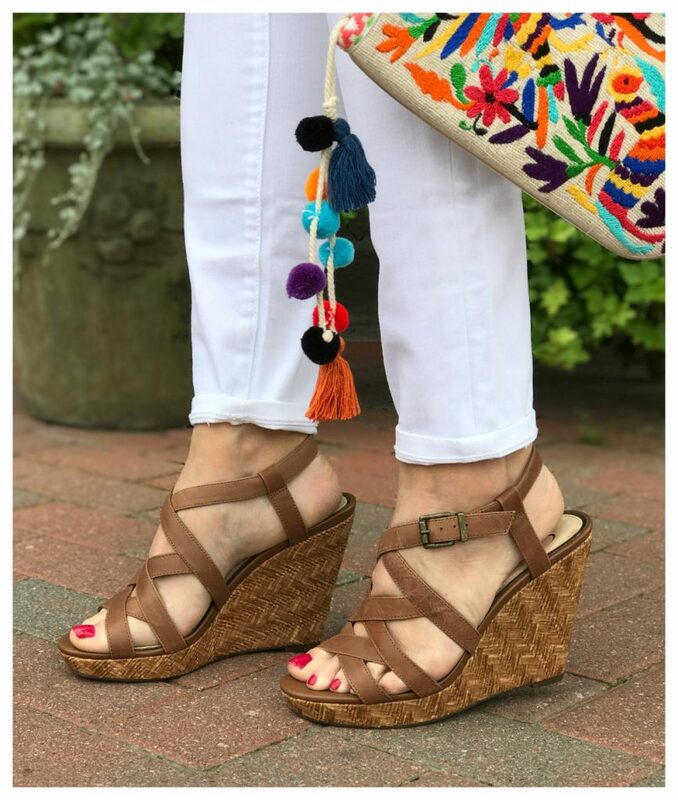 The wedges are comfy and I really like the different textures of the leather on the straps and the look of woven rafia on the actual wedge. And the color is great…not too dark, not too light, and they go with everything. I could pair them with shorts just as easily as I could with a sundress. 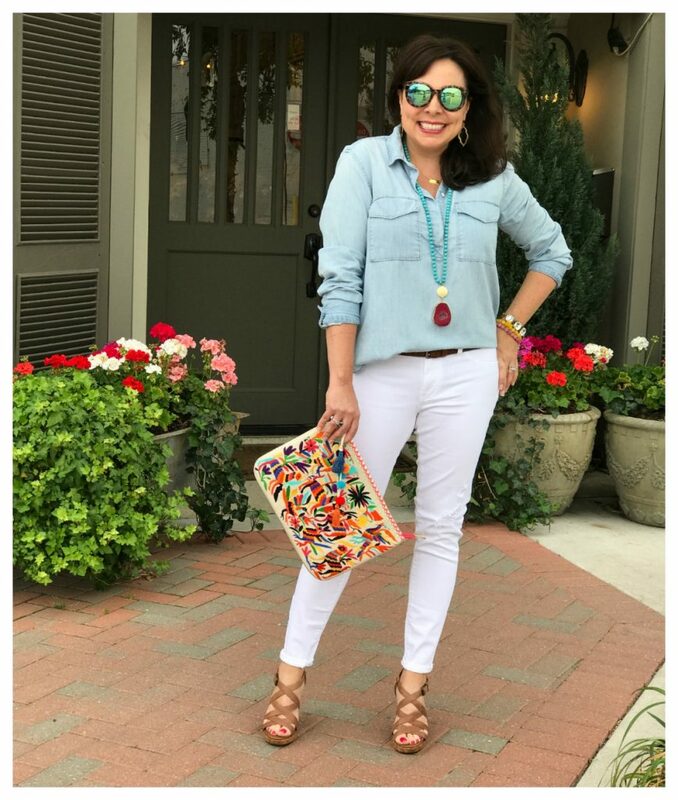 I don’t think I ever owned a clutch before this blog, but I’ve definitely become a clutch lover. 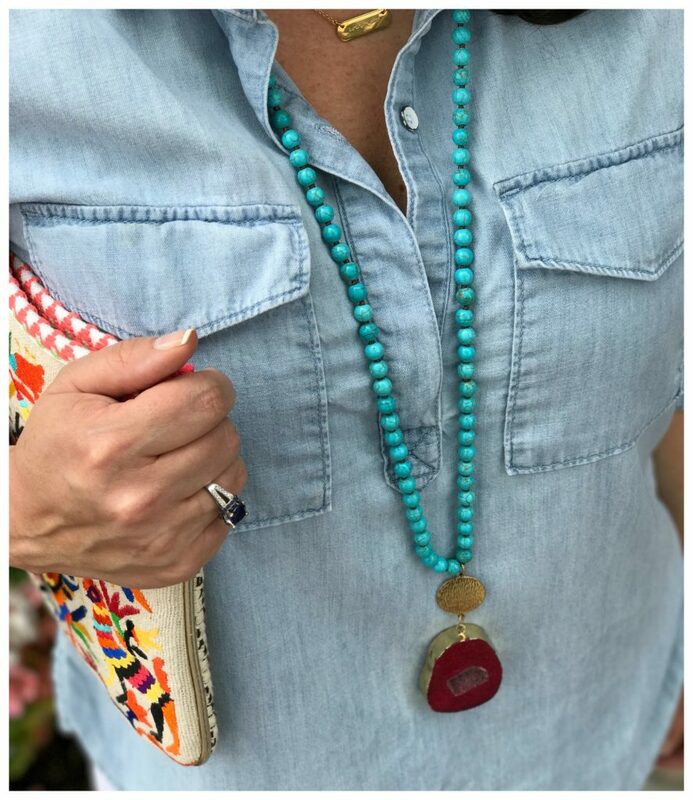 They typically add so much to an outfit, and they are perfect for date nights, girl’s nights out, weddings, and other types of spring and summer events. 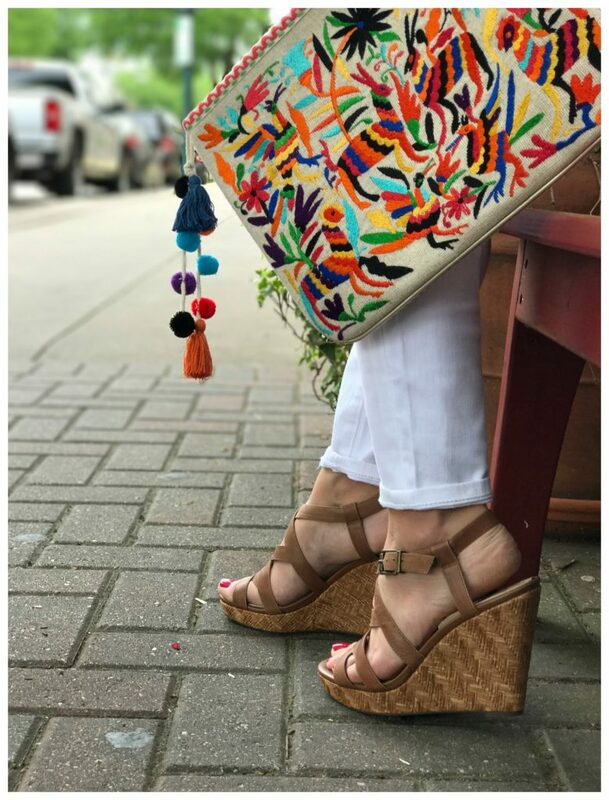 Sometimes a big bag just ruins the look of an outfit, so a clutch is the answer. Since my clutch keeps going in and out of stock, I have several darling options for y’all! 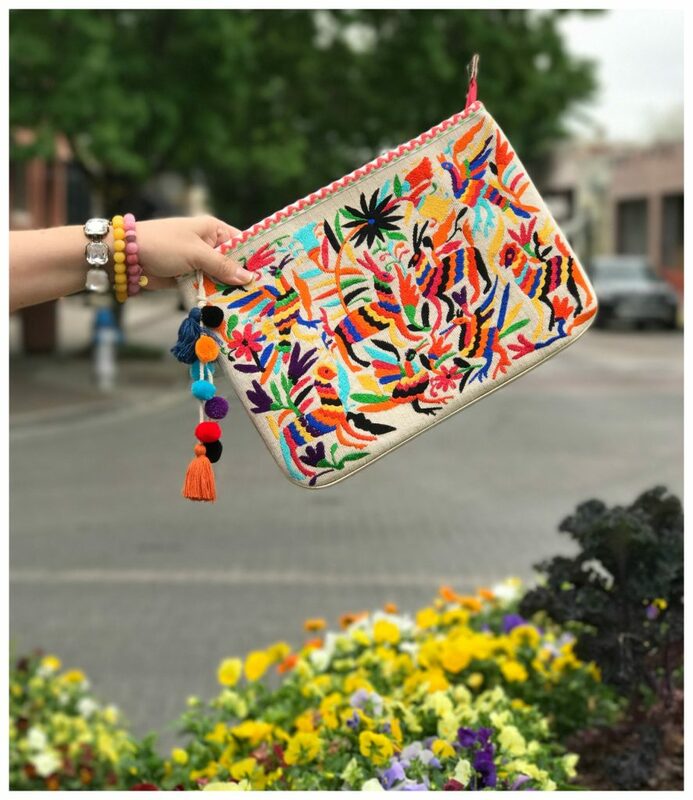 The clutches highlighted below range in price from like $15-$150 and are from all different retailers (LOFT, Target, Nordstrom Rack, and Nordstrom). My favorites are 3 (also comes in a blue and black), 4, 7, and 11. Eleven is only $22.97 and also comes in a coral and a black! Before you go, you all need to know that Ann Taylor and LOFT are both having unbelievable sales. We’re talking 50% OFF EVERYTHING and FREE SHIPPING WITH NO MINIMUM at LOFT and 50% OFF everything at Ann Taylor. 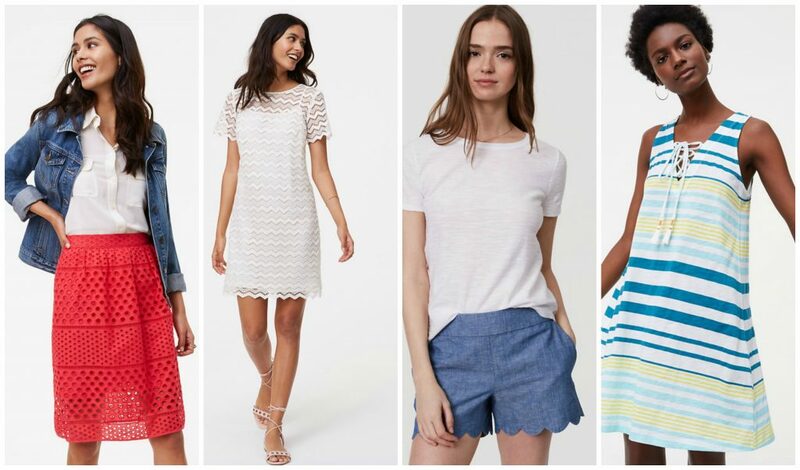 Below are some favorites from LOFT. I will tell you, my sister will be featuring the eyelet skirt on the left in her next WORK WEAR post that’s a week from today. She already has it and thinks it’s precious! See y’all back here tomorrow for a BONUS POST this week! There’s a special event on HauteLook on Tuesday that I’m excited to highlight! This is one of my FAVORITE combinations!! Love the whole look! So so cute!! Great pictures today, Sheaffer! Before your blog, I’m not even sure I knew what a clutch was (ha!) but you feature the CUTEST clutches!! 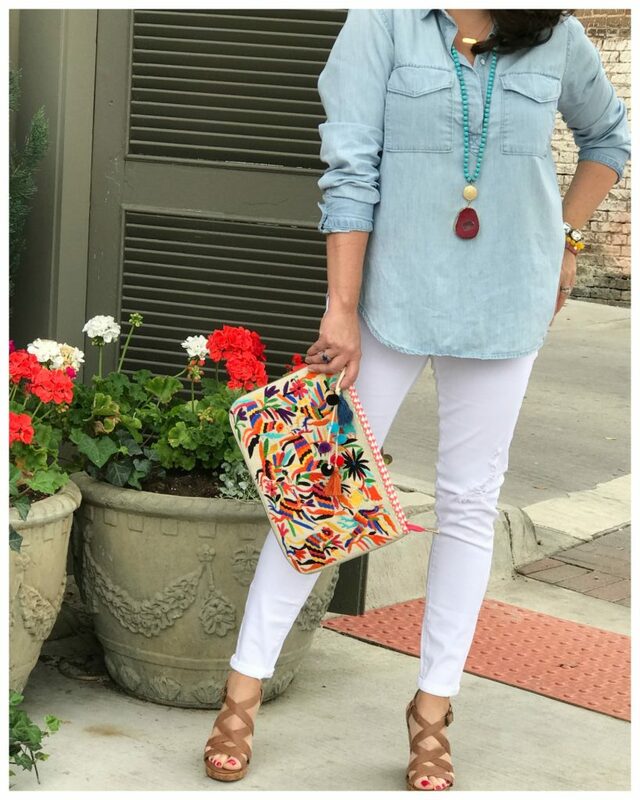 Gorgeous outfit, I love the combination of the white jeans with the light blue shirt. And I’ve never own a clutch until this weekend, actually haha I saw one that was super pretty and bought it because it was totally out of my comfort zone and I wanted to ask if clutches are just as comfortable as bags because with a bag we can put it over our shoulder or on our arm but with a clutch we have to hold it with our hands, right? In my mind, it seems a bit of a struggle so I don’t know if I’ll use my new clutch in very long days. 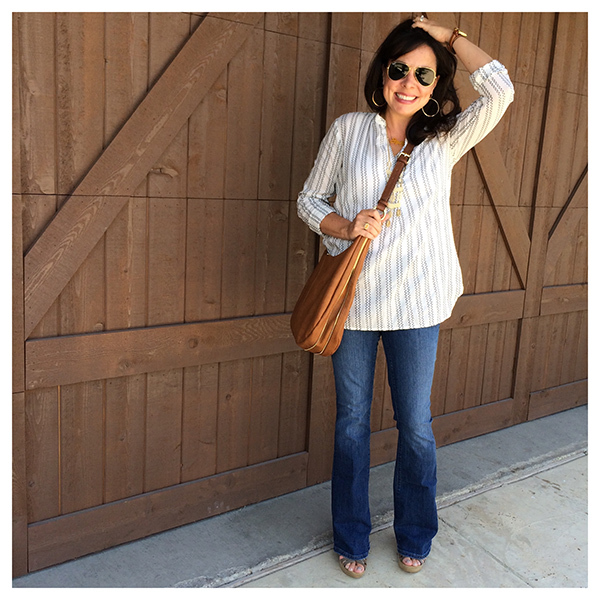 Everything goes with white denim in my book – love this look! Those clutches are darling! And, I love that outfit combo! Perfect! I’m not usually a clutch girl, but yours is adorable! 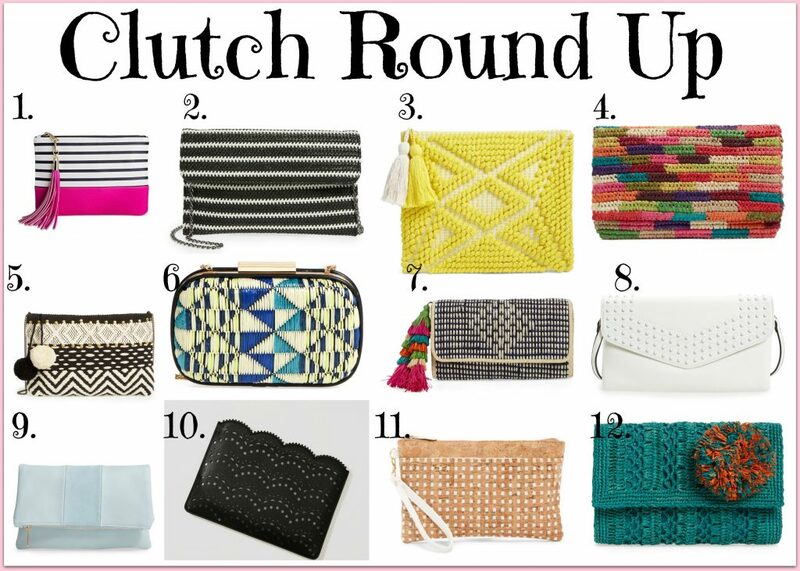 Great clutch roundup- so many cute and unique options. And those BP sunglasses are nice! You can definitely find a gem in the BP department for sunnies. One of my favorite go-to combos. I love how you have paired it with wedges and I love that clutch and bracelet stack. This look is spot-on! I think I may buy the entire look. Haha! I am also hitting Loft online! You looks great and Very put together! Such a cute outfit!! And I’m obsessed with that clutch and your wedges!!! 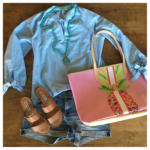 Does the top from the loft come in Petite size? Hi, Shelby! It doesn’t. 🙁 So sorry! Just an FYI on the other Steve Madden clutch that sold out on Nordstrom Rack. The “Jyme” clutch. It is also available on Lord & Taylors site and they have 30% off “friends and family” today. Also if you go through Shoprunner, you get free shipping!! $52.50 total shipped. ???? Such a cute and classic look. I need those wedges! White denim is my fav! It’s so versatile!